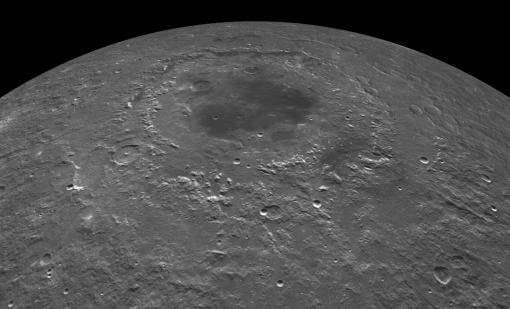 Early in the Moon’s history an ocean of molten rock covered its entire surface. As that lunar magma ocean cooled over millions of years, it differentiated to form the Moon’s crust and mantle. But according to a new analysis by planetary scientists from Brown University, this wasn’t the last time the Moon’s surface was melted on a massive scale. The research, led by graduate student William Vaughan, shows that the impact event that formed the Orientale basin on the Moon’s western edge and far side produced a sea of melted rock 220 miles across and at least six miles deep. Similar seas of impact melt were probably present at various times in at least 30 other large impact basins on the Moon. The research is published in the April issue of the journal Icarus. Vaughan and his colleagues show that as these melt seas cooled, they differentiated in a way that was similar to the lunar magma ocean. As a result, rocks formed in melt seas could be mistaken for “pristine” rocks formed very early in the Moon’s history, the researchers say. That includes rocks brought back during the Apollo program and Russia’s Luna missions. It’s quite possible, the researchers say, that impact melt material is present in lunar samples thought to be representative of the early formation of the lunar crust. The amount of rock formed in melt seas is far from trivial. Vaughan and his colleagues estimate that impacts forming the Moon’s 30 large basins produced 100 million cubic kilometers of melt, enough to make up 5 percent of the Moon’s crust. If lunar samples do include melt material, it would help to explain some puzzling findings from lunar samples. For example, in 2011 an analysis of a sample assumed to have originated in the early lunar crust suggested that the sample was 200 million years younger than the estimated time when the lunar magma ocean solidified. That led some researchers to conclude either that the Moon is younger than previously estimated or that the lunar magma ocean theory was flawed. But if that sample actually originated from a melt sea, its young age could be explained without rewriting the history of the Moon. The Orientale basin is only partly visible from Earth on the western edge of the Moon’s near side. Because it’s one of the few basins on the Moon that hasn’t filled in with volcanic basalt, it provides a great place to investigate the geology of melt seas and to test whether they differentiate as they cool. For the Orientale melt sea to have differentiated, it must have been liquid for a long time — thousands of years. To be liquid that long, it must have been quite thick. That left the researchers with a question that wasn’t easy to answer: How thick was the Orientale melt? “In pictures, you’re just seeing the top of an impact melt body, so we have to find a way to infer how thick it was,” Vaughan said. To do that, Vaughan and his colleagues took advantage of the fact that a liquid shrinks when it cools and solidifies. Data from the Lunar Orbiter Laser Altimeter (LOLA) showed that the sheet had subsided by about two kilometers from the surrounding rock, giving the researchers an idea of how much the sea shrank. With that data, they could calculate its volume and infer its depth. According to the calculations, the Orientale melt sea must have been at least 10 kilometers thick. Far shallower melt sheets from impacts on Earth are known to have differentiated, so it’s a safe bet that Orientale was thick enough to differentiate. The next question was what that differentiation might look like. Based on the compositions of the lunar crust and mantle material melted, Vaughan could determine the composition of the impact melt sea. From there, he could make a model of what rocks would have formed as the melt sea cooled. According to the model, thick layers of rocks like dunite and pyroxenite form at the base of the melt sea from dense, early crystallizing minerals that sink through the melt. Other minerals float up through the melt to form layers of rocks such as norite at the top of the melt sea — very similar to differentiation processes in the lunar magma ocean. Vaughan’s model is supported by remote sensing data from the Maunder crater, the remnant of an impact that excavated material from the melt sheet after it cooled. The data confirm a noritic composition at least four kilometers deep in the melt sheet. Taken together, the findings suggest that impact melt seas produce rock in a way that’s very similar to the lunar magma ocean. And that could help to clear up some lingering questions about the magma ocean paradigm.